What's in a Violin Case? Most Violin and Viola cases have a plywood shell. Less commonly the shell is made from plastic or foam. 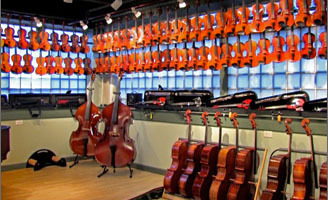 Foam shell cases such as the Bam violin and viola cases are very lightweight, but lack the rigidity of wood. But they have better resistance to changes in humidity and temperature. People have driven a car over a wood shell case and the instrument survived. Cello cases are also being made of wood, but plastic models have become more popular for their lighter weight. However, the Winter Carry-Lite is light for a wood shell case. Use of fibreglass in cello cases has declined, but flight cases are still made this way. Fibreglass can crack, especially when cold, and fibreglass production uses chemicals whose emissions are potentially harmful to the environment. A common question from our customers is related to suspension padding. A non suspension case still has pads, but not as much so as suspension cases. Most cases are called Suspension, but if you are on a budget, don't be afraid to order a non-suspension case. One of the finest cases in the world, Gordge, is a non suspension case. 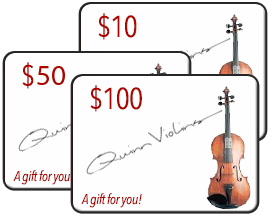 If you're a violin or viola player, traveling with your instrument is simple. Just take it on board with you. Cellists and Bassists either have to buy an extra seat, or check their precious instruments in baggage where anything might happen to it. A special shipping case is in order, such as the SBS flight case for Bass (cello case coming soon), or the Take-Off flight case for 4/4 Cello. Both of these products have special padding and inflation devices to ensure a safe trip for your instrument. Click on either of these products to learn more. As an alternative for Cellists, Bam makes the Flight Cover, a foam padded cover that fits Bam Cello cases. The great feature of this product is that you can remove it when you reach your destination then use your case as usual. The nicest thing you can do for your instrument is remove the fittings before shipping. The likelihood of a damage free voyage increases if there is no bridge, tailpiece, strings or pegs. Knock the sound post over as well. The Chinrest can stay if it's tightened securely. Put all the parts in a bag so they don't roll around in the case during transit and scratch the varnish. If you must leave the instrument set up, at least tune it down a 1/2 step to remove some tension. Wrap the bridge and tailpiece with padding in case they become loose and float around inside the case. Bubble wrap sometimes leaves an impression in certain types of varnish so use something else for padding. Add padding underneath the fingerboard in case the neck comes out. Wrap around the pegbox so a peg can't work its way loose. Ship by air, overnight if possible, and insure the package for full value. If you have instrument insurance, be sure you are covered in case of total loss during shipping. If you really like the appearance of your case, you might want to display it prominently with the lid open. A violin case can be the perfect centerpiece on the piano in your studio. However, the alignment of the lid may be temporarily compromised if left open for extended periods of time. Gravity has a gradual effect of slightly warping the parts of your case. So, when you go to close the case, the lid does not meet the base perfectly. No worry, this is only temporary. If you leave the case closed for an extended period of time, it will "remember" its proper alignment. The most important question we hear from our customers is "How much should I spend on a case?" The encouraging fact is, protective cases are not expensive. You can get top quality protection on almost any budget. What you get with higher prices more features, premium quality fabrics, hardware and distictive designs. High end models offer lighter weights, extra strength, and/or a unique aesthetic appeal. If those factors are important to you, the extra budget is appropriate.